One part African American soul, one part fiery Latino and all New York attitude. Chef Nelson German is a Dominican-American who was born and bred in uptown Manhattan’s Washington Heights. He has trained countless hours in NYC kitchens and has spent over a decade creating his destiny through culinary travels, sacrifices, burns, cuts, getting yelled at by the Chef, you name it. Nelson’s passion, drive and humble nature has propelled him through the hardships of the restaurant industry to finally reaching his dream come to fruition in his 1st Chef driven eatery alaMar. Nelson’s journey to the Bay area began in 2010 when he left the “Big City of Dreams” and moved to Oakland where he immediately fell in love with the culture and realness of The Town. He was introduced to the rising food scene in Oakland from a visit and culinary stage at Jack London Square’s BocaNova. He was impressed and started venturing out to other Oakland eateries and soon found out that Oakland had a very special up and coming food culture. Even though he loved Oakland it was always one of his goals to work and hone his craft in San Francisco, so he did for 4 years but knew that he will eventually end up on Team Oakland. He was Executive Chef of the unique “Dinner in Bed” concept Supperclub SF and then he helped open Marbella, a modern Spanish restaurant, on Polk Street. German’s unorthodox culinary style draws from his Dominican heritage, his embrace of Mediterranean cuisine and Asian influence from working under internationally acclaimed Chef Yugi Wakiya. Coupled with his love of California’s passion for ingredients that are local and sustainable, his cuisine draws people in by its uniqueness and comforting flavor profiles. As you see Nelson made his return to Oakland in a big way by opening alaMar and he is very proud to have his first baby in the town he loves. It doesn’t stop there as within alaMar’s first year he has earned a coveted 2015 Michelin Guide recommendation, bringing Chef Nelson German one step closer to achieving his ultimate goal of becoming a Michelin star Chef. alaMar marks the very first venture born from Nelson’s love and passion for creating art with his food. In January 2017, alaMar converted from a full service restaurant to a cashless fine casual restaurant in order to combat the rising minimum wage and high cost of operating a restaurant. As a result of this change, sales increased by 33% over the previous year. This year, alaMar is on pace for a projected 30% increase. 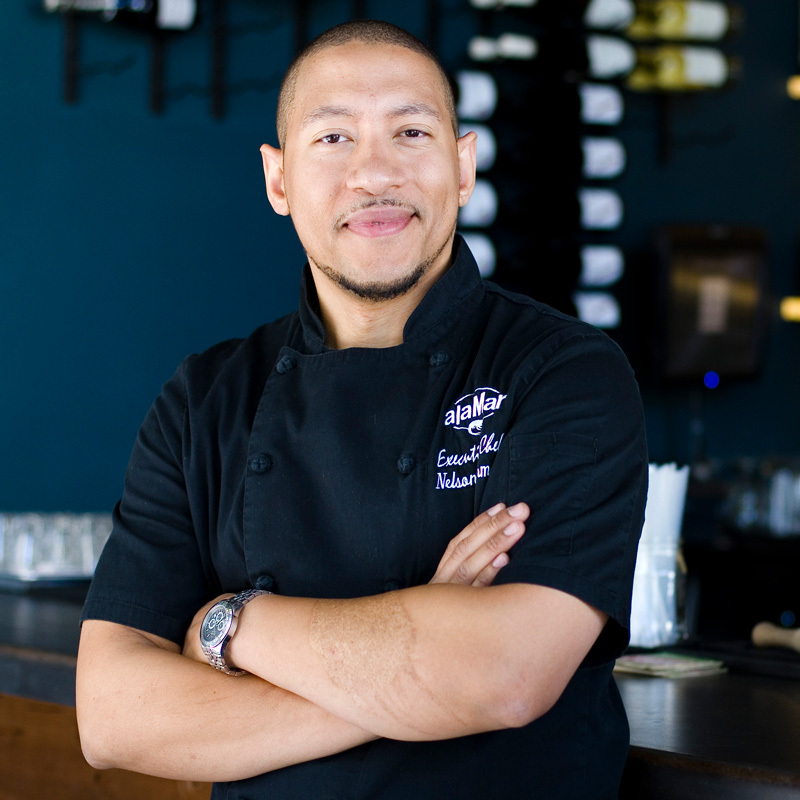 Chef Nelson is proud to call Oakland home to his first eatery.